Adult Hodgkin lymphoma is a disease in which malignant (cancer) cells form in the lymph system. Adult Hodgkin lymphoma is a type of cancer that develops in the lymph system. 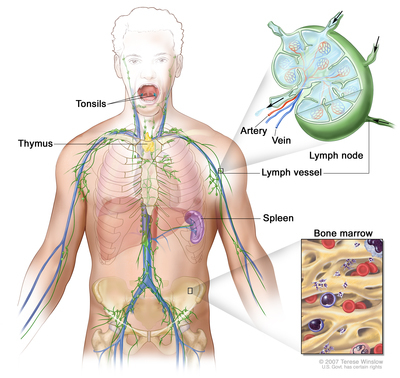 The lymph system is part of the immune system. It helps protect the body from infection and disease. Hodgkin lymphoma can occur in both adults and children. Treatment for adults is different than treatment for children. Hodgkin lymphoma may also occur in patients who have acquired immunodeficiency syndrome (AIDS); these patients require special treatment. Hodgkin lymphoma in pregnant women is the same as the disease in nonpregnant women of childbearing age. However, treatment is different for pregnant women. This summary includes information about treating Hodgkin lymphoma during pregnancy. There are two main types of Hodgkin lymphoma: classical and nodular lymphocyte-predominant. Age, gender, and Epstein-Barr infection can affect the risk of adult Hodgkin lymphoma. Being in young or late adulthood. Having a first-degree relative (parent, brother, or sister) with Hodgkin lymphoma. Pregnancy is not a risk factor for Hodgkin lymphoma. Signs of adult Hodgkin lymphoma include swollen lymph nodes, fever, night sweats, and weight loss. Painless, swollen lymph nodes in the neck, underarm, or groin. Tests that examine the lymph system and other parts of the body are used to help detect (find) and diagnose adult Hodgkin lymphoma. Physical exam and history: An exam of the body to check general signs of health, including checking for signs of disease, such as lumps or anything else that seems unusual. A history of the patient's health, including fever, night sweats, and weight loss, past illnesses and treatments will also be taken. 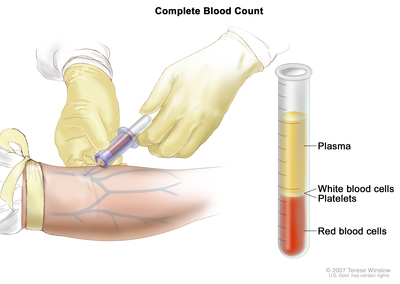 Sedimentation rate: A procedure in which a sample of blood is drawn and checked for the rate at which the red blood cells settle to the bottom of the test tube. The sedimentation rate is a measure of how much inflammation is in the body. A higher than normal sedimentation rate may be a sign of lymphoma or another condition. Also called erythrocyte sedimentation rate, sed rate, or ESR. PET-CT scan: A procedure that combines the pictures from a positron emission tomography (PET) scan and a computed tomography (CT) scan. The PET and CT scans are done at the same time on the same machine. The pictures from both scans are combined to make a more detailed picture than either test would make by itself. A PET scan is a procedure to find malignant tumor cells in the body. A small amount of radioactive glucose (sugar) is injected into a vein. The PET scanner rotates around the body and makes a picture of where glucose is being used in the body. Malignant tumor cells show up brighter in the picture because they are more active and take up more glucose than normal cells do. Lymph node biopsy: The removal of all or part of a lymph node. A pathologist views the tissue under a microscope to look for cancer cells, especially Reed-Sternberg cells. 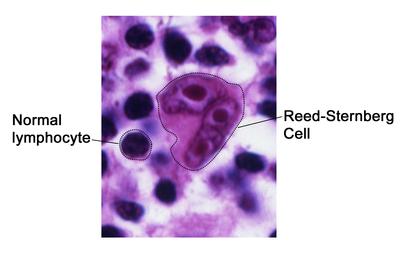 Reed-Sternberg cells are common in classical Hodgkin lymphoma. Other areas of the body, such as the liver, lung, bone, bone marrow, and brain, may also have a sample of tissue removed and checked by a pathologist for signs of cancer. The patient's signs and symptoms. The patient's age, gender, and general health. Whether the cancer is recurrent or progressive. The age of the fetus. Adult Hodgkin lymphoma can usually be cured if found and treated early.